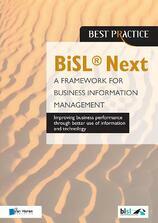 This book describes the framework of the next generation of Business Information Services Library, BiSL®. BiSL Next is a public domain standard for business information management with guiding principles, good practices and practical templates. It offers guidance for digitally engaged business leaders and those who collaborate with them, with the ultimate goal to improve business performance through better use of information and technology. Twelve elements - four drivers, four domains and four perspectives - are the basis of the guidance in BiSL Next. Target audience of this book are business managers, business information managers, business analysts, CIO's and IT managers, as well as consultants in this field. While describing the twelve elements, the book offers them insight in the best way to manage, execute and profit from business information management in their enterprise. The book is also the official literature for the BiSL® Next Foundation exam.